October 17, 2018 – There’s no better place to be during holiday time than New York City. As always, the Holiday Markets and Macy’s Thanksgiving Day Parade kicks off the season, with floats, balloons and marching bands. 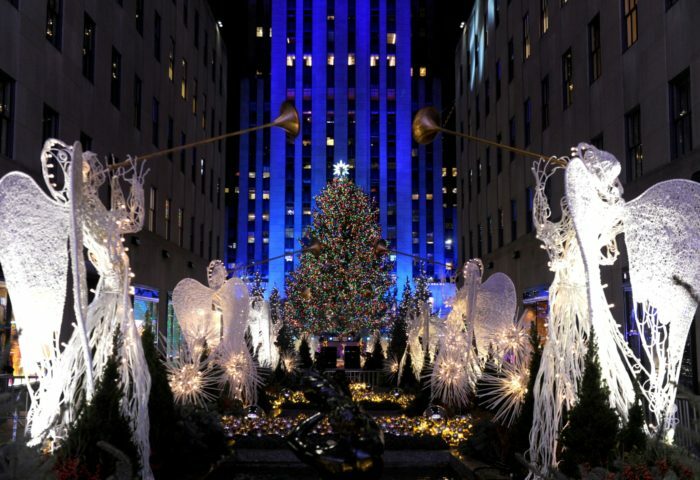 Other exciting, family-friendly events include the Radio City Christmas Spectacular, the Holiday Train Shows at the New York Botanical Garden and Grand Central Terminal, Kwanzaa celebrations at the Apollo Theater and American Museum of Natural History, and the informal competition for largest Hanukkah menorah. For details on these and many other happenings, read on. New York City’s many ice-skating rinks are synonymous with winter and the first glimpse of the holiday season. If you prefer your skating experience to come with a killer view, take a spin at Wollman Rink (open late-October through March), with its amazing skyline vistas from inside Central Park, or enjoy the spectacular surroundings of the seasonal Rink at Rockefeller Center (in December, the famous tree will be there too). The Bank of America Winter Village at Bryant Park, which is open October to March, is another fine option with stunning architecture nearby. For an indoor experience that will make you feel like a professional hockey or skating star, visit City Ice Pavilion in Queens or the Aviator Sports & Events Center in Brooklyn; both operate year-round. After taking a few turns around the ice-skating rink, finish up your holiday shopping at The Holiday Shops at Winter Village at Bryant Park. Browse the many vendor booths offering clothing, jewelry, household gifts, crafts, art and more. New York City takes its shopping experience to a new level with the many holiday markets that pop up for the season. So grab a cup of hot cocoa and brave the cold to find homemade wares for everyone on your list at the three big outdoor markets—Union Square Holiday Market, Holiday Shops at Winter Village at Bryant Park and Columbus Circle Holiday Market—or stay warm at the indoor Grand Central Holiday Fair. This iconic song-and-dance extravaganza, featuring the legendary Rockettes, is one of the holiday season’s must-see attractions. This year’s show combines such classic scenes as “Parade of the Wooden Soldiers” and “New York at Christmas” with new numbers and cutting-edge digital projection and digital mapping technology, which transforms Radio City Music Hall’s interior into a giant canvas. The New York Transit Museum Gallery Annex and Store at Grand Central Terminal is back with its annual Holiday Train Show, whose layout features Lionel trains traveling through a two-level, 34-foot-long miniature New York City and countryside scene. Vintage trains from the museum’s collection, including New York Central models, travel all the way to the diorama’s North Pole. Model trains navigate painstakingly crafted miniatures of New York City’s built environment, all made entirely out of plant parts. The Statue of Liberty, the Brooklyn Bridge and Yankee Stadium are among the 150 landmarks that form a fantastically rendered city landscape built from seeds, bark, leaves and twigs, serviced by a robust half-mile of track, all nestled within the stunning and historic Enid A. Haupt Conservatory. This year’s train show showcases Lower Manhattan’s famous skyscrapers with replicas of the Woolworth Building and One World Trade Center—and some vintage ferry boats, too. Other events coinciding with the train show include a cappella performances, classical music concerts, a poetry reading and activities for kids. Holiday decor gets a historical makeover with the American Museum of Natural History’s annual Origami Holiday Tree. The museum draws inspiration from its own items for the nearly 1,000 folded-paper works, constructed by volunteers throughout the year. After exploring the permanent-exhibition halls, current shows and expansive collections, see which pieces made their way onto the 13-foot tree. It’s likely you already know the fanciful, fantastical Christmas Eve story and Tchaikovsky’s unforgettable melodies—but it’s certain that no NYC holiday season is complete without seeing choreographer George Balanchine’s confection come to life. The glittering classic, performed annually by the New York City Ballet since 1954, has become one of the City’s signature family-friendly traditions. Expect to warm your spirits with visions of the Sugarplum Fairy dancing in your head. It doesn’t get much more picture-postcard NYC Christmas than the sight of the stately Rockefeller Center Christmas tree, towering above the ice rink below, all decked out in its finest holiday bling. Things get even more festive when thousands of revelers fill the area for the lighting of the Norway spruce. A star-studded lineup, usually hosted by NBC Today show anchors, provides plenty of live entertainment. The crowning moment comes when the switch is flipped and the Swarovski star–topped tree’s tens of thousands of (energy-efficient LED) lights come alive. Expect plenty of “oohs” and “ahs” from the crowd. If you can’t make it to the big event on November 28, worry not—you can see the tree (and snap plenty of photos of it) through early January. Each December tour company A Slice of Brooklyn presents this bus tour of the famous Dyker Heights Christmas lights. More than 100,000 people visit the Brooklyn neighborhood annually to see the awe-inspiring decorations—many of which have lights synchronized to music and animatronic features. Rather than wander the neighborhood yourself, let A Slice of Brooklyn guide you on this 3.5-hour jaunt—during which you’ll learn stories of the homeowners so dedicated to the art of holiday cheer. Some may even come out and greet you. The legendary Apollo Theater presents several holiday events this month, kicking off with the free annual Coca-Cola Winter Wonderland festival. Take pictures with Santa and hear music from local a cappella groups and choirs; in the evening, there’s a special holiday edition of Amateur Night. Other events include a Holiday Joy Gospel Concert and Kwanzaa Celebration on December 29. The annual 23 Days of Flatiron Cheer brings many holiday-time traditions to this proud neighborhood. Throughout the three-plus weeks, expect an interactive installation in the North Public Plaza at Broadway and 23rd Street, performances from local groups, contests and giveaways from local businesses. Most of the events will take place in the public plazas surrounding the Flatiron Building. The Metropolitan Opera takes Wolfgang Amadeus Mozart’s Magic Flute and adapts it into a family-friendly, English-language version that’s full of holiday spirit and enchantment. Conductor Harry Bicket leads the production directed by Juile Taymor (from Broadway’s The Lion King), which stars Nathan Gunn as bird catcher Papageno, along with Erin Morley and Ben Bliss as the princess and prince.